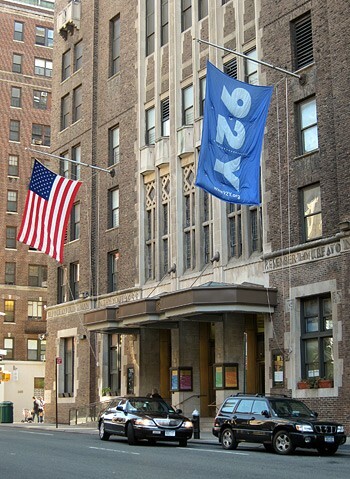 92nd Street Y in New York City hosts series. Barrington Stage Company (BSC) continues the “Live from NY’s 92nd Street Y” Simulcasts with three programs for winter 2012. The popular satellite broadcast series brings lectures, interviews and readings from nationally and internationally recognized political figures, entertainers, newsmakers and authors to communities across the U.S. and Canada. The “Live from NY’s 92nd Street Y” lectures will be broadcast to BSC’s Mainstage Theatre located at 30 Union Street in Downtown Pittsfield. These programs are sponsored in part by Knesset Israel and the Dorothy and Carl Wildman Endowment. Walter Isaacson, author of a new biography of Steve Jobs, discusses the significance of Jobs’s contributions to the business world and explains his drive as it revolutionized six industries: personal computers, animated movies, music, phones, tablet computing and digital publishing. Jobs stands as the ultimate icon of inventiveness and applied imagination, and he built a company where leaps of imagination were combined with remarkable feats of engineering. Isaacson looks at Jobs for important lessons about innovation, character, leadership and values. Walter Isaacson, CEO of the Aspen Institute, has been chairman of CNN and managing editor of Time magazine. He is the author of Benjamin Franklin: An American Life and Kissinger: A Biography and the coauthor of The Wise Men: Six Friends and the World They Made. Rick Stengel is managing editor of Time magazine. Mandy Patinkin’s career encompasses theater, film, television, recordings and the concert stage. His Broadway credits include Evita, The Secret Garden, Sunday in the Park with George and solo concerts. He has appeared in more than 20 feature films, multiple television series and has made numerous solo recordings. Thane Rosenbaum is a novelist and law professor at Fordham University and the director of the Forum on Law, Culture and Society. Gloria Steinem talks about her travels in this and other countries as an organizer, lecturer and frequent media spokeswoman on issues of equality and her work organizing across boundaries for peace and justice. In 1972, Gloria Steinem co-founded Ms. Magazine, and in 1973, she became the founding president of the Ms. Foundation for Women. Her books include Outrageous Acts and Everyday Rebellions, among others. She is currently at work on Road to the Heart: America as if Everyone Mattered. Budd Mishkin is the host and reporter for NY1’s “One on 1 with Budd Mishkin.” This event is part of the Ruth Stanton Illustrious Women Series, supported by The Ruth Stanton Foundation. Winter 2012 Live from the 92Y events will be broadcast live via satellite from the 92nd Street Y in New York City. The live simulcasts will be interactive experiences, as audience members will have the chance, during the live event, to submit questions to the speakers via email.